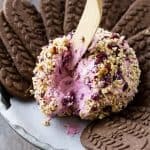 My Blackberry Breakfast Cheese Ball with Granola is a great way to turn over a new leaf and start your day off right. And especially perfect for a brunch! Breakfast has never looked so good! The holidays are busy, heck, all our days are busy. Trying to squeeze in breakfast with all of our hectic schedules gets more and more difficult each day much less having something that you actually WANT to eat. How many handfuls of stale cereal have you shoved in your mouth while walking out of the door dragging your kids and their lunchboxes? What about that dreaded greasy drive-thru that you submit to when you can’t even get stale cereal? I have something new, with some actual nutrients, that is fun to eat for the most important meal of the day! Not to mention it will be the star of your next brunch or breakfast get-together. A breakfast cheese ball! Yes, a breakfast cheese ball. Read on, my intrigued and hopefully drooling friends! What in the world is a Breakfast Cheese Ball? Being your faithful source for all things appetizer, cocktail, and must-have party foods, believe it or not, I CAN make something for breakfast too. A cheese ball may seem weird for breakfast as most of the cheese balls I make are for parties and are usually on the savory side. My Dirty Martini and Wasabi Ginger Cheese Balls are perfect for parties but not breakfast. Before you think that a cheese ball is not suitable for breakfast, let’s think about what people usually eat in the morning. Bagels shmeared with cream cheese, cups of yogurt, and granola bars are part of a typical line-up along with bacon and eggs. Why can’t we combine the cream cheese and yogurt? This seems completely acceptable to me! Let’s add some frozen fruit like the sweet delicious blackberries I froze at the end of the summer when they were ripe and I bought 15 pounds of them knowing even then I wouldn’t eat them all before they went bad. Now we have fruit and calcium handled. A touch of sweetness from the honey you will have in your tea or on your toast makes it almost complete. The only thing a Breakfast Cheese Ball needs now is a crunch, and some fiber. This is where the granola comes in! I use an ancient grain and nut granola so it is gluten-free but feel free to make your own recipe. Now that your breakfast cheese ball is complete how do you plan to get it into your mouth? Don’t get me wrong, I am all for just picking up the entire ball and walking out the door while taking quick bites out of it, but a more civilized breakfast gathering might need something to help bridge the gap. 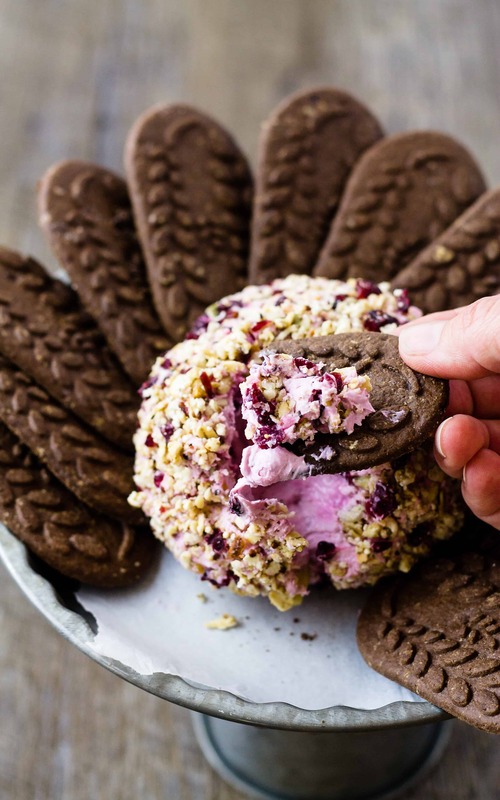 I serve mine with chocolate “breakfast” cookies that I find at the store but it tastes great with bagels, toasts, biscuits, and on the plate next to my bacon and eggs! 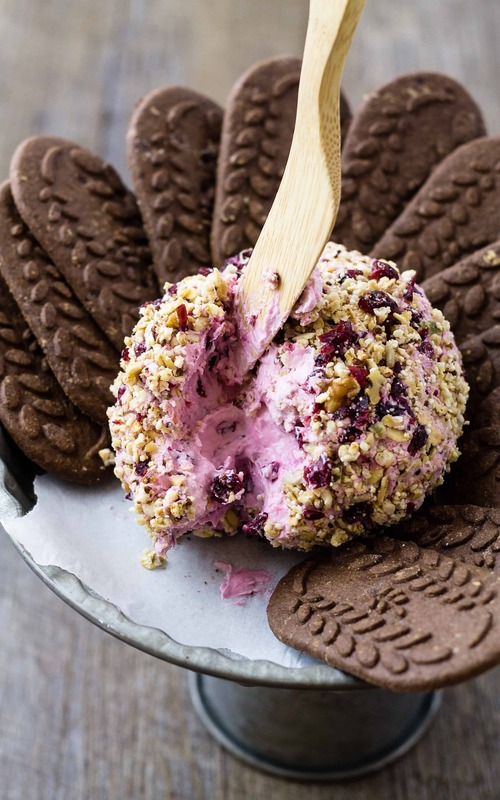 Whether you want to wow your guests at a fancy brunch or just make your holiday mornings easier, the Blackberry Breakfast Cheese Ball is just what you need to accomplish these goals. My Blackberry Breakfast Cheese Ball with Granola is a great way to turn over a new leaf and start your day off right. Perfect for brunch! Cream together both types of cream cheese and honey. Fold in the frozen blackberries. Shape into a ball and wrap in plastic wrap. Chill in the fridge for 30 minutes or up to 5 days. 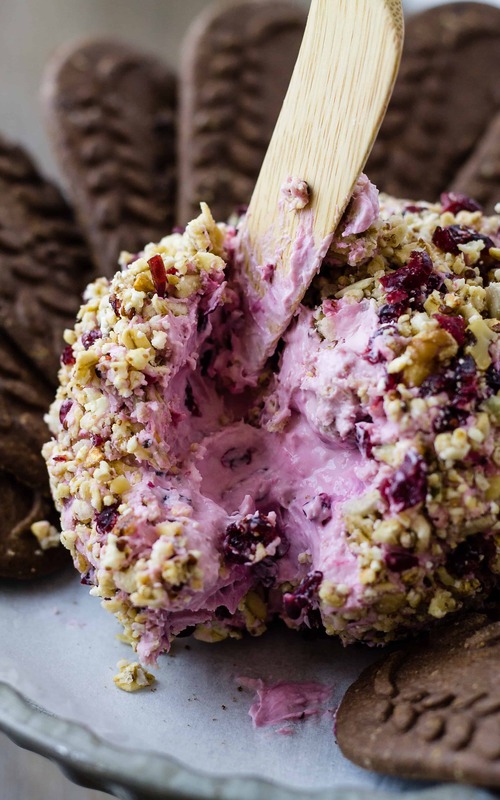 When ready to serve, roll in the granola and dried cranberries. 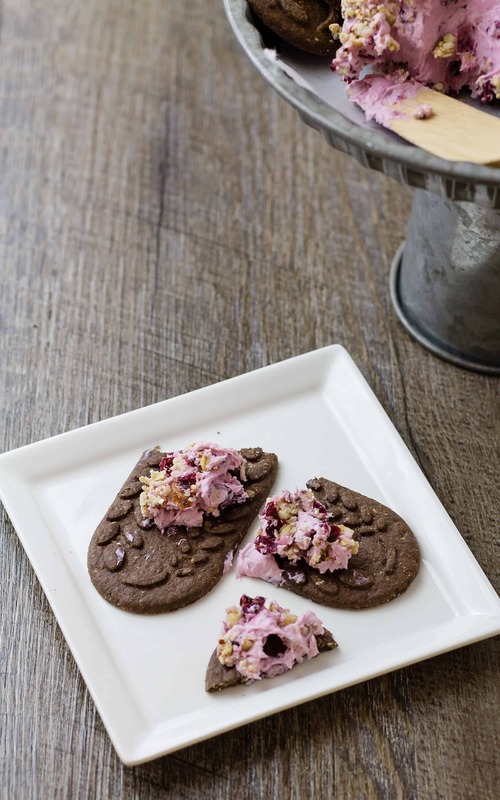 Serve with breakfast cookies or bagel chips. * for this recipe I use Trader Joes Ancient Grains and Nuts Granola but feel free to use your favorite or make your own from scratch. 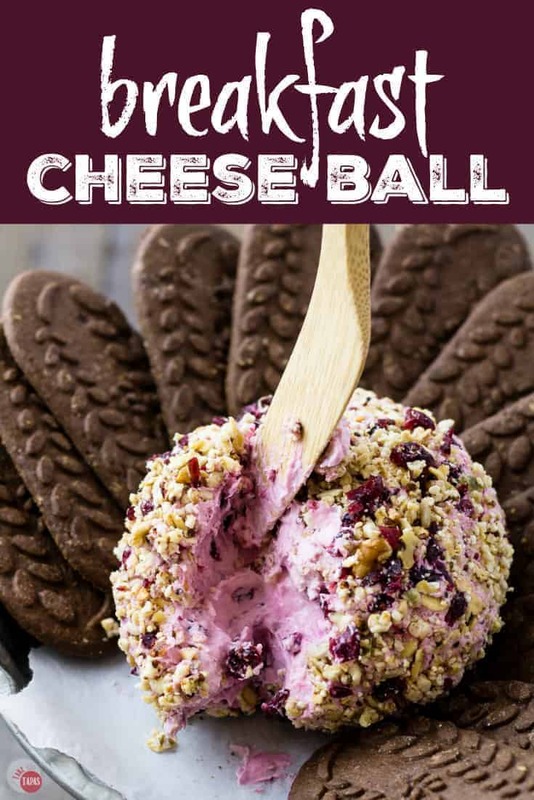 *the cream cheese/Greek yogurt mix needs to stay cold as the cheese ball will be very loose if you use it softened so keep it cold while mixing. 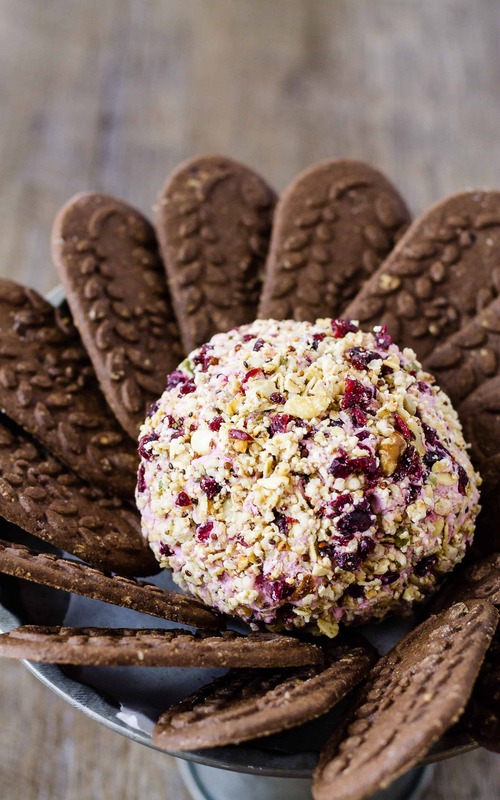 *I like to serve this Breakfast Cheese Ball with Chocolate Breakfast Cookies but it goes great with bagels, biscuits, and toast. *If you like this recipe, rate it with some stars!!! Oh my, this looks so delicious. I could slather this all over a bagel in the morning or like you show, with chocolate wafers. Super Scrummy!